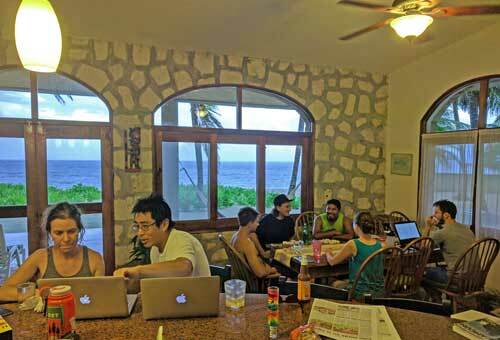 What’s better than learning to code in paradise? 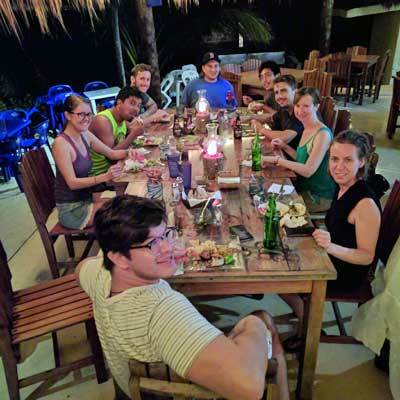 Learning to code in paradise with an endless stream of delicious tacos! 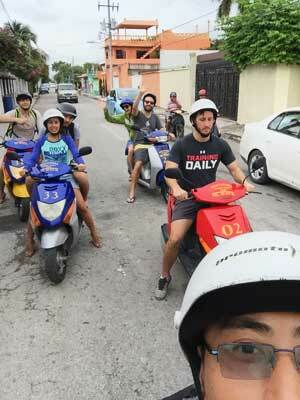 After hosting coding bootcamps in Bali and Thailand last year, Playa del Carmen, Mexico was the perfect spot to round out CodingNomads’ international software engineering trainings for 2017. 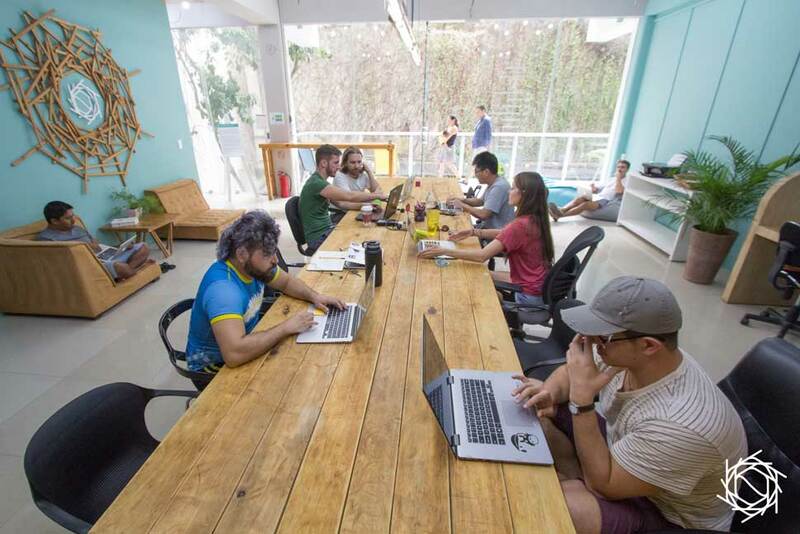 Aside from the tacos, the CodingNomads Mexico cohort arrived with fire in their jets, ready to travel and learn programming. Coming from varying walks of life, and from around the world, each student was excited to take life up a notch. 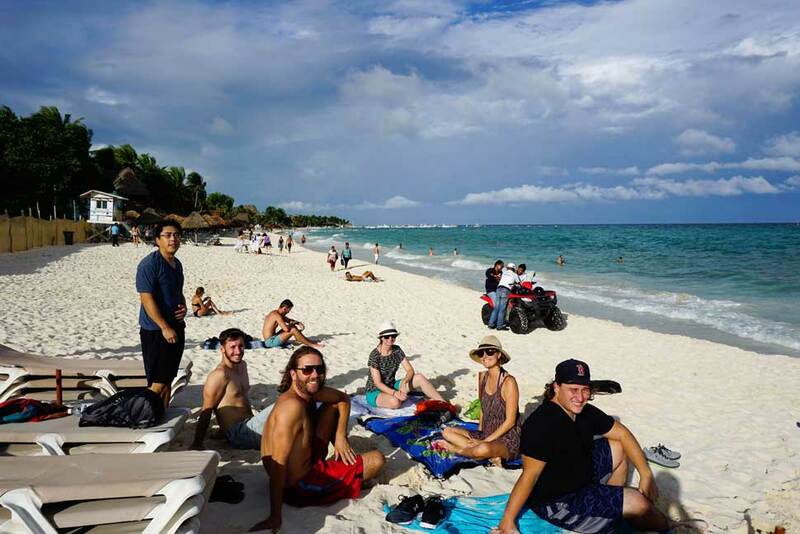 In addition to gaining a breadth and depth of software engineering skills, our Mexico cohort had a blast living the digital nomad lifestyle with their new group of friends. Keep reading to learn about the cutting edge cryptocurrency applications our team built – one of which is already generating income for our student utilizing it…talk about return on investment! 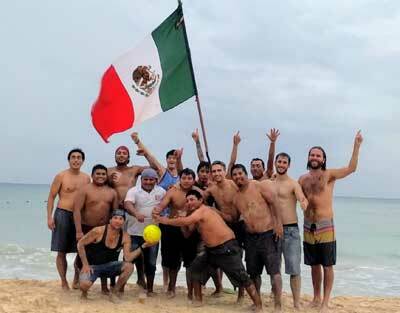 Plus see photos from the fun we had at CodingNomads’ coding bootcamp in Playa del Carmen. Our accelerated Java + SQL + AWS program prepares students with a trifecta of skills that are in high demand worldwide: Java programming language, SQL database management, and AWS infrastructure. We also cover critical concepts such as the Spring Framework, RESTful API development, MVC development, security, shell scripting, deployment, scalability, Git, Jira, and more, to prepare students for life as a developer. To see our syllabus with a list of the technical concepts we teach, visit our Java coding bootcamp web page. 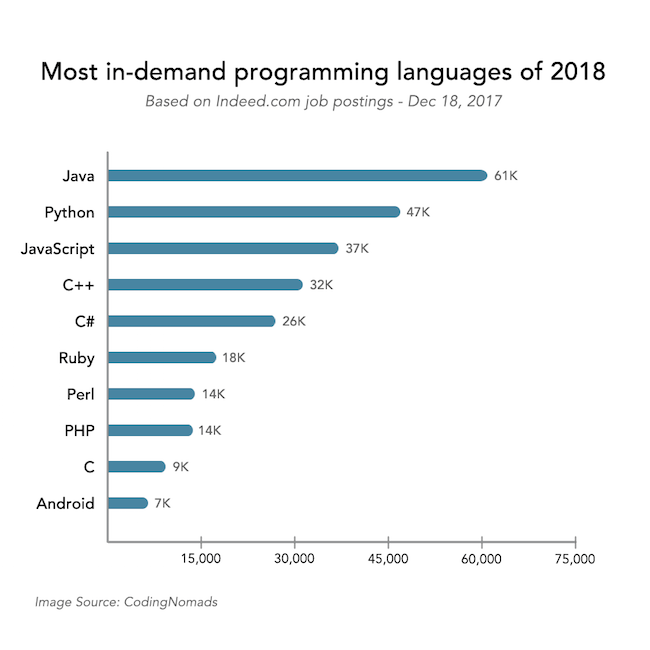 In 2018, Java continues as the #1 most in-demand programming language for jobs in the US. Only 12% of coding bootcamps teach Java, giving CodingNomads’ alumni a competitive advantage in the job search. These are just some of the many reasons why we think Java is a fantastic programming language to learn. RELATED: So many stacks, so little time. 7 reasons to learn Java. Our students learn to execute the day-to-day tasks of server-side engineers. They can apply these skills to jobs with companies across all industry sectors, or build their own projects as entrepreneurs. As our students have varying end-goals for learning to code, we thrive on making the course informative and rewarding for everyone. Check out our student reviews on SwitchUp and Course Report. 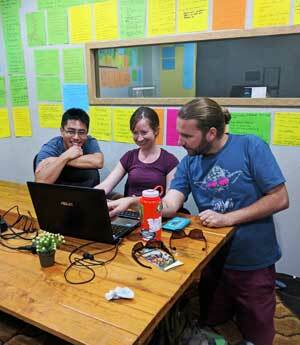 In the final 4 weeks of our bootcamp (online), students implement the skills learned in the previous 8 weeks (onsite). Our Mexico cohort created three final projects focusing on cryptocurrency technology, machine learning and more. Mimicking the scrum sessions and delivery schedule of a professional developer, students had daily one-on-one code review sessions with our instructors, and weekly check-ins with the team. A standalone Java application to monitor and automate cryptocurrency trading. This project is already making money! It is enabled with multi-exchange arbitrage, triangular arbitrage, and email alerting. You can let the bot make a trade for you, or you can opt to receive email alerts when a substantial arbitrage opportunity has been discovered. “AWSMLCrypto” is a Spring-based RESTful API for aggregating cryptocurrency price information. This API uses AWS Redshift and AWS Machine Learning models to make continuous evolving and improving predictions on future coin valuations. Source code. A comprehensive Spring-based client library for the Kraken cryptocurrency exchange. This project allows any Java developer to import this library as a single dependency into their own project to attain simple and comprehensive access to the Kraken API. 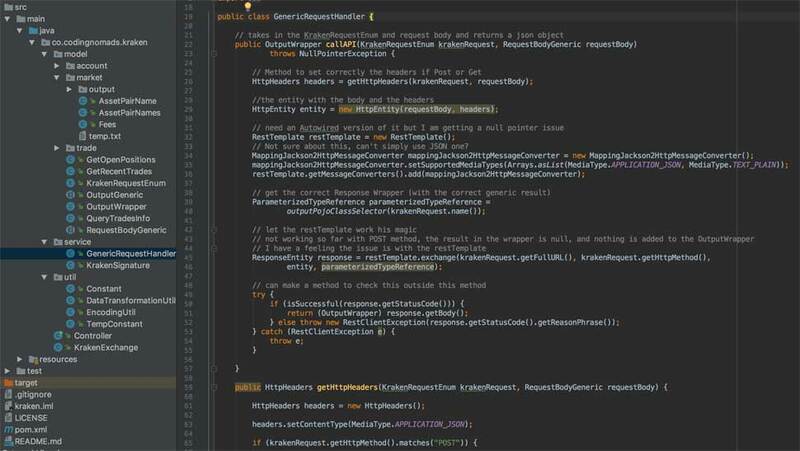 Source code, and screenshot below. Rightly so, our Mexico students opted to remain solely focused on finishing their final projects through the end of the bootcamp before diving into the job search. However we continue to support alumni after the course to ensure they continue pushing towards their career goals, and get the most out of their coding bootcamp investment. For some that means continuing to learn and build confidence as a professional engineer. We provide additional resources, assignments and mentorship to keep graduates motivated and fresh. For others it means helping them update their resumes and professional profiles online, as well as conducting mock interviews to prepare them for the real deal. Our students attend our bootcamps with various goals, so we provide custom support for each student’s particular path. RELATED: How to find a job after a coding bootcamp. Jialor Cheung, CodingNomads Mexico Alumni. Read full review. 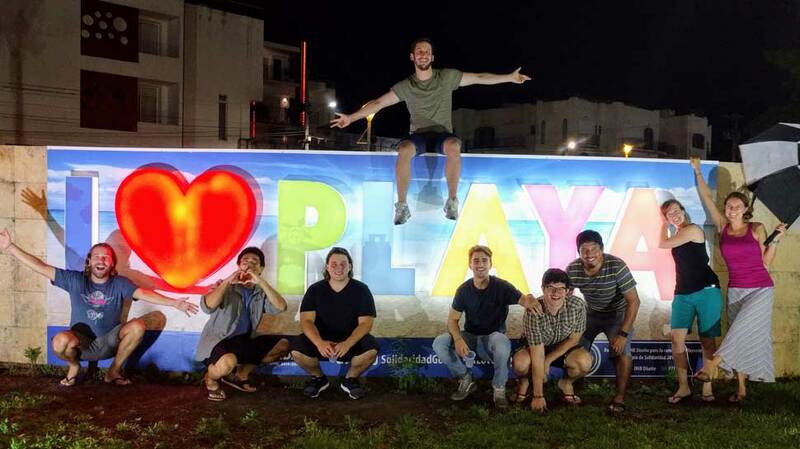 After hosting our previous coding bootcamps in South East Asia, Playa del Carmen felt so much closer to home – and not just in terms of flight times! 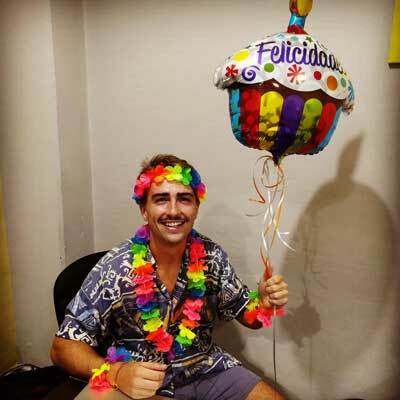 With a thriving expat, tourist and digital nomad scene, we had all the comforts and amenities we needed for a productive course and enjoyable stay…and then some! 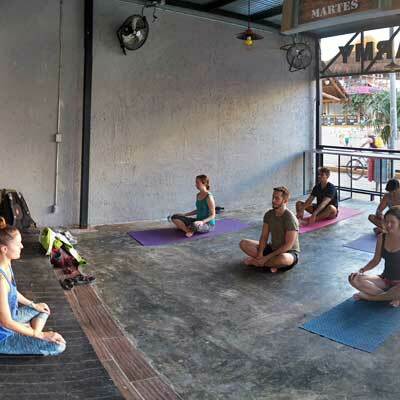 Our classroom space at Nest Coworking was just a few blocks from the white sand beaches and warm blue waters of the Caribbean. This made for easy lunch breaks on the beach! 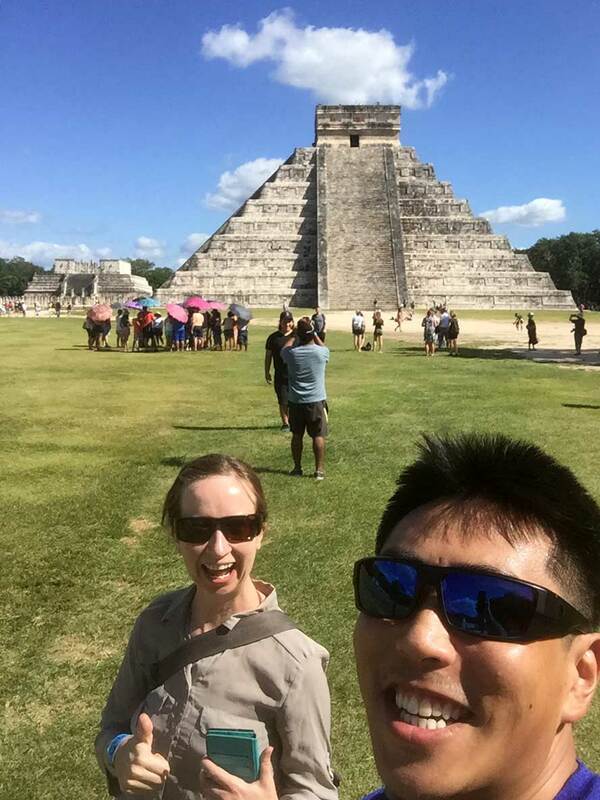 On the weekends we explored the Yucatan Peninsula, visited ancient Mayan ruins, rented scooters on Cozumel, and tried our feet at salsa dancing. We took a weekend team trip to nearby Tulum, where we rented a beach house and witnessed the hatching of 80+ sea turtles right off our back patio. Together with the conservationists patrolling the beach for baby turtles gone astray, we helped gather the turtles, and set their course straight into the ocean. 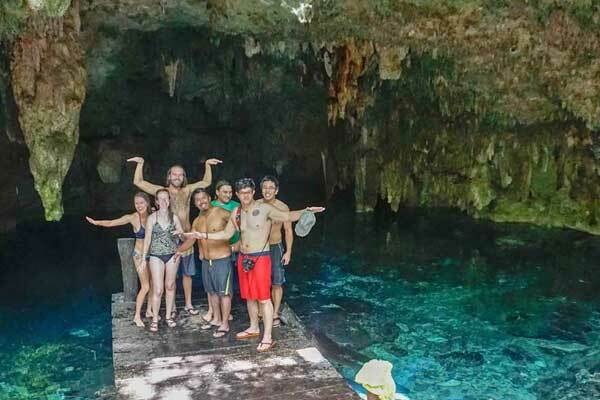 We went on snorkeling tours of “cenotes,” which are natural sinkholes that sometimes fill with pristine fresh water, creating underground caverns with majestic rock formations. 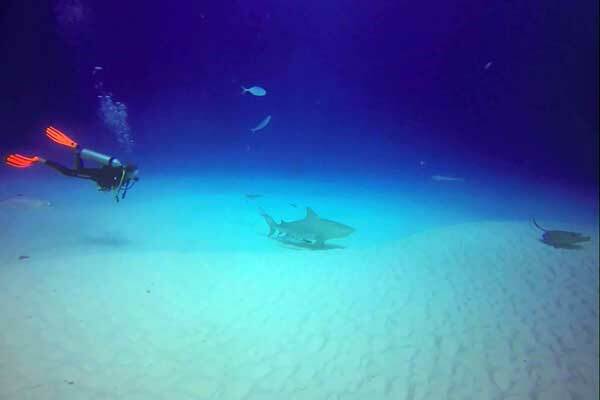 Some of us also went scuba diving with bull sharks, one of the most thrilling experiences of our lives. 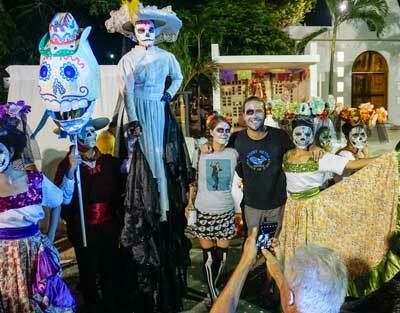 If you haven’t yet visited the Yucatan, put it high on your travel list! 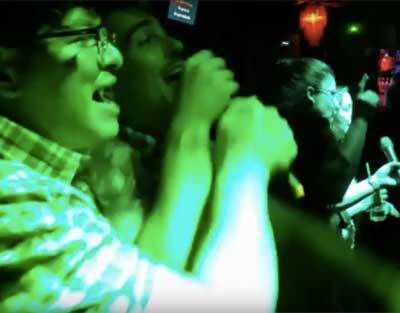 We got an authentic taste of Mexican culture by playing beach soccer with locals, participating in Day of the Dead, and even attempting to sing karaoke with our local friends in Spanish. We celebrated our Assistant Instructor Caden’s birthday, did weekly opt-in yoga, and of course, we ate lots, and lots, and lots of tacos. Overall, we had a blast! We are incredibly proud of the hard work our students put into the course, emerging as a new group of software developers, friends, and world travelers. Huge congrats to our Mexico coding bootcamp cohort of 2017! Our upcoming Bali coding bootcamp is in March 2018, and we can’t wait to go back! 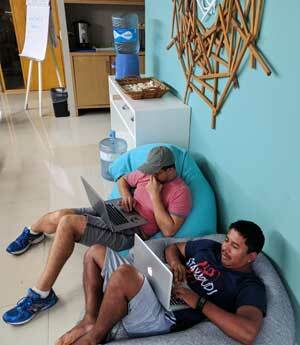 Seats are filling up, so get in touch with us and submit your application before our Bali coding bootcamp sells out. Additionally, Bali students can join our 4 week, part-time, Online Introduction to Java starting January 29 for FREE. Our 4 week online course is also open to anyone interested in learning server-side engineering fundamentals without having to quit your job or skip town! Anyone who takes our online course and then signs up for one of our destination bootcamps receives a rebate for the online course, giving students an extra 4 weeks of coding instruction and mentorship for free! Heck ya. Where would YOU like to attend a bootcamp? Let us know on our Facebook and Instagram!